We’re kicking off Odyssey Performance Art Festival with a parade. 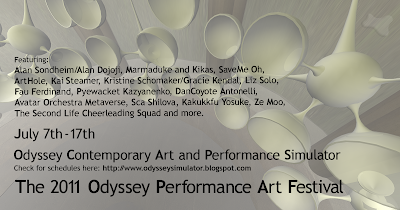 Led by Pyewacket Kazyanenko the event will start off on top of Sugar Mountain on Odyssey and parade down, through and around the sim. SaveMe Oh gives the word cinema a new dimension with the reprise of her ScreenMe performance. Originally made for SaveMe’s return in Caerleon but rejected at the last moment, ScreenMe has been performed only once before, in May 2011, on the Amsterdam sim. Gracie Kendal, also known as Kristine Schomaker in real life, just completed her Thesis for the Masters Degree in Art with the execution of her “My Life as an Avatar” www.graciekendal.wordpress.com where she utilizes installation, text, photography, mixed media, video and performance to explore her real life through the lens of her second life avatar. An interactive happening by Kakukkfu Yosuke. Using Yosuke’s scripted prims become a shadow, play with fleshlights. Wednesday July 13 – Noon SLT – EXTRA PERFORMANCE! A hybrid reality performance – avatars and humans in real space terraform and beautify the front of the Eastern Edge Gallery in St. John’s, Newfoundland.